23/31 City/Highway MPG Headquarter Mazda may be a brand-new dealership, but we come from a proven, family-friendly dealership background. We look forward to meeting you, showing you our inventory, and helping you drive off with a car you’ll love! ABS brakes, Active Cruise Control, Alloy wheels, Electronic Stability Control, Front dual zone A/C, Heated door mirrors, Heated front seats, Heated rear seats, Illuminated entry, Low tire pressure warning, Nappa Leather Seat Trim, Navigation System, Power moonroof, Remote keyless entry, Traction control. 23/31 City/Highway MPG Headquarter Mazda may be a brand-new dealership, but we come from a proven, family-friendly dealership background. We look forward to meeting you, showing you our inventory, and helping you drive off with a car you’ll love! 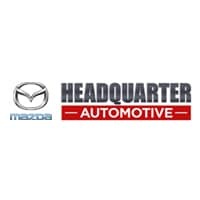 26/35 City/Highway MPG Headquarter Mazda may be a brand-new dealership, but we come from a proven, family-friendly dealership background. We look forward to meeting you, showing you our inventory, and helping you drive off with a car you’ll love!